Cream-Of-Chicken Soup Recipe - Quick and Easy! 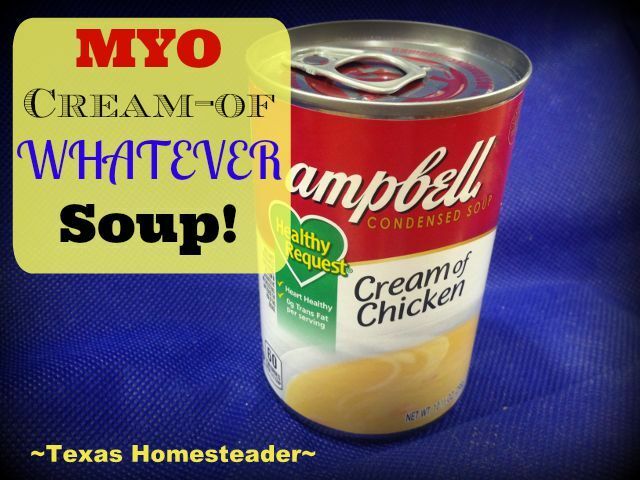 MYO Cream-Of-Chicken Soup In A SNAP! Recently I wanted to make my handsome RancherMan a homemade Chicken Pot Pie, but I wanted to make it totally from scratch. Cooking with cream-of-something soups helps to make recipes quick & easy but you know those commercial cans of soup are full of sodium. Now don’t get me wrong, I have a can of the stuff sitting in my pantry for ‘those’ moments, but whenever possible I like to make my own cream-of-Chicken soup (or celery, or mushroom, or…) The good news is that it’s so super easy to make myself that the can of commercial stuff is still sitting unused in my pantry. Check it out, y’all! This homemade cream of chicken soup is made with wholesome ingredients from my own kitchen, ingredients I recognize and can pronounce! And although the commercial stuff sells for $1.79/can at our local store, my homemade version costs only pennies since I’m using such goodness as homemade chicken broth & dehydrated veggies from my garden. So let’s get to putting this soup together! After about 5 minutes of simmering my dehydrated veggies are ready to go. I add some milk, flour & spices – whatever my palate is in the mood for and whatever spice would go well with the dish I’m making. Often it’s just salt & pepper but I’ll also add in minced garlic or chopped thyme if the mood strikes me. Yep, shootin’ from the hip – that’s the way I cook here on the ranch! Now comes the even easier part: Simmer & stir until it gets as thick as I want it and BOOM! Cream-of-Chicken Soup! Sans the tin can and much of the salt, along with any of the other ingredients I could never pronounce. If you want a heartier soup you can add shredded chicken, but since I wanted this soup to go into my chicken pot pie which already had the chicken for my recipe, I used this soup just like this! I’ve also used this soup recipe with shredded chicken added when making chicken & rice. Quick. Easy. Dee-LICIOUS! So if you’d like to step away from the soup isle at the grocery store and enjoy a less expensive, less wasteful and healthier option, give this recipe a try. It’s very flexible since you can add seasonings as your taste dictates. No need to run to the store when you need a can Cream of WHATEVER soup. It's quick & easy to make yourself! And without those questionable ingredients in the canned stuff. In a small bowl mix 4 Tablespoons flour, salt, pepper, and 1/4 teaspoon celery seed. In a saucepan over medium heat, add flour mixture & slowly stir in 2 1/4 cups chicken broth and 1/4 cups milk. Simmer over medium heat until thick. You can add leftover shredded chicken if desired for a meatier soup. Remove from heat and use in the place of a can of Cream-Of-Chicken soup in your recipe! 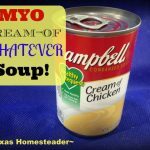 This entry was posted in Blog Posts and tagged Cooking, Environment, Frugality, Make-It-Yourself, Recipes on August 9, 2015 by Texas Homesteader. I have a budget recipe for making 3 meals from one chicken. The first meal is chicken pot pie. You slow cook the chicken first and use the resulting juices as stock. I simply saute some onion in butter then add flour to make a rue. Add chicken stock and milk stirring till thickened. I usually flavour with pepper and thyme. Then just add the shredded chicken and cooked vegetables. This mixture is enough for 2 pies and is really easy. I also use a similar method using beef stock, mushrooms and sour cream to make a sauce for Swedish meatballs. Tastes delicious. Sounds pretty easy to me! Thanks for sharing on the What’s for Dinner Link up! And Happy Thanksgiving! Thanks for the recipe! Looks like a much healthier option! I make chicken pot pie all the time and will have to give homemade cream soup a try. Thanks for sharing your recipe. Wow, I had no idea it was so easy! Thanks for sharing with Simply Natural Saturdays. I’ve seen more complicated recipes than this!! I would never use another can of cream of anything soup (unless it was my very fav recipe…then I might make it ONCE in awhile…). I bought some organic stuff, it’s $2.50 a carton. Eeek! Def will pin this for future reference! Thanks for sharing at the Family Joy linkup! I hear ya, I have one or two of those cans in my pantry for the same reason, but when there’s time to make it all healthy then that’s the way to go for me! This looks like such an easy recipe and yummy too! Thank you for posting this! I have an MSG sesitivity and as a result, I have given up a lot of processed food. I miss the ‘cream-of’ soups, and I am glad to have found this so I can make casseroles again! Thanks for sharing. Thanks for sharing on the What’s for Dinner link up and don’t forget to leave a comment at the party – Next week’s features that also leave a comment get pinned and tweeted! Great idea!! Thanks for Linking up at My 2 Favorite Things on Thursday!! Hope to see you again this week!! Pinned! I’ve been buying the organic Pacific brand condensed soups just because I thought making my own would be much too time consuming. I guess I was wrong! Thank you for sharing with us at Merry Monday! Love it! I’m always looking for ways to get away from the premade store garbage. Thanks for sharing on the Homestead Blog Hop! What a great post. I absolutely have to cut down on my sodium. Canned foods was the first thing to go. I will certainly use this recipe. Come share this post at Snickerdoodle Sunday. The party is in full swing. Here is the link. http://www.sewtravelinspired.com/ Our party goers would love it. While you’re there share a comment on a natural wonder near you. Thank you for sharing this! As we look ahead to the fall I know we’ll start to crave comfort foods, but I really prefer to cook from scratch (when I can). This is a great tip to modify some of our heartier recipes! Love it… my fiancee is an agriculture science major at Texas A&M commerce and we hope to one day have our own self sustaining ranch. I hope to hear more of what it takes to run your homestead.